September 21, 1997, L. G. Crabo. 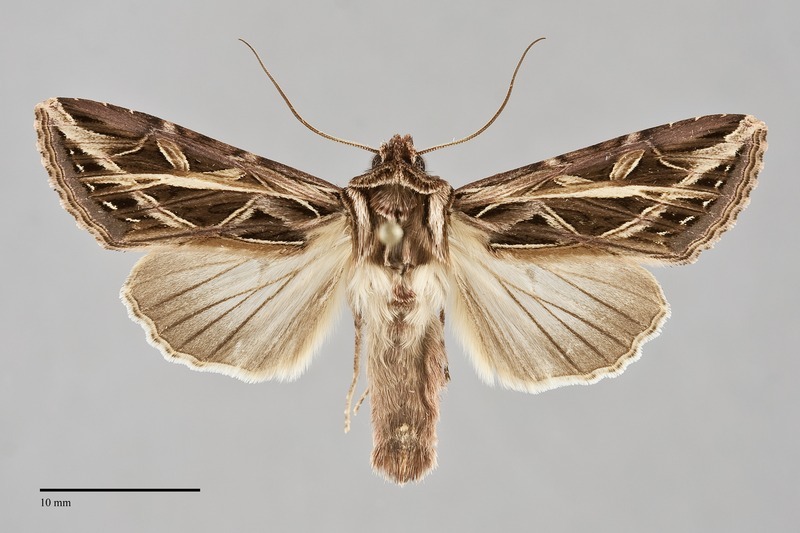 Dargida procinctus is a medium to large sized moth (FW length 18 - 22 mm) with a geometric net-like light ochre-brown pattern on a purple-brown and dark brown ground. The apex of the wing is slightly elongated and the outer margin is slightly scalloped. The ground color is purplish brown. 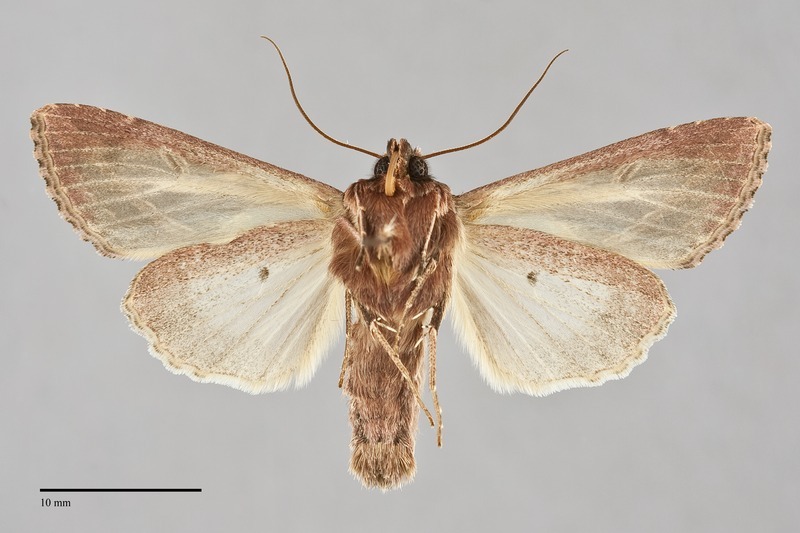 The base of the costa is streaky straw and brown, the trailing margin is tan, and the terminal area is purple-gray except at the apex. An oblique straw-colored line at the apex appears to be the continuation of the similar posterior postmedial line. A complex pattern of pale and dark lines is present at the base of the wing. The antemedial and postmedial lines are comprised of parallel straw-colored line. These lines nearly touch on the median wing. The antemedial line is oblique from the trailing margin to the cubital vein, then bent sharply toward the apex to touch the medial orbicular spot. The postmedial line is smoothly curved from the trailing margin toward the apex, bending acutely and thinning abruptly on vein M2, coursing toward the base from the bend to end on the costa near the reniform spot. The postmedial line is a series of golden yellow lines or wedges between the veins from the pale apical mark to the fold. It is preceded by black wedges and followed by black spots between the veins. The terminal line is brown, thin. The fringe is light brown with parallel brown lines and distal checkering. The orbicular and reniform spots are outlined in pale straw. The filling is brown peripherally and pale centrally. The orbicular spot is a thin ellipsoid, tilted with the anterior portion toward the base. The reniform spot is similar but upright, tilted in the opposite direction with the anterior aspect toward the apex. The claviform spot is dark, filled with the ground color. The hindwing is gray at the base, gradually darkening brown-gray toward the outer margin, with dark veins, thin discal spot, and terminal line. The hindwing fringe is tricolored with a yellow base, gray median line, and white edge. The head and thorax are light and dark brown with stripes on the head, collar, and tegulae. Paired weak tufts are present on the anterior thorax. The abdomen is slightly reddish brown with dorsal tufts on the anterior segments. The surface of the eye is hairy. The male antenna is bead-like. 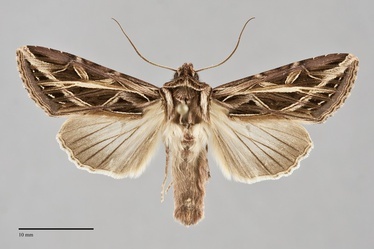 This common moth is unlikely to be confused with other species due to its distinctive forewing pattern of straw-colored longitudinal and transverse lines and relatively large size. It is completely unlike our other Dargida species in size, color, and pattern except for the light-colored cubital vein. This species is widely distributed in open grassy habitats throughout much of western North America. In the Pacific Northwest, it is common to abundant in moist grasslands at low elevations both east and west of the Cascades, particularly in agricultural grass fields, disturbed pastures, and wet meadows of riparian zones along creeks and rivers. It is a serious agricultural pest in grass seed fields west of the Cascades. It is usually less common in dry, open ponderosa pine forests and juniper woodlands at middle elevations east of the Cascades, and at high elevations along the summit of the Cascades and in the Rocky Mountain region. Dargida procinctus is common at low to middle elevations throughout the Pacific Northwest except in the driest portions of the interior. It is found on both sides of the Coast and Cascade Mountains and is commonly found in urban areas. This species occurs in the American West. Outside of the Pacific Northwest it occurs from Saskatchewan to Colorado and west through Utah and Nevada to California. This species is a specialist feeding on grasses (Poaceae), and particularly prefers tall coarse grasses such as orchard grass (Dactylis glomerata) and rye grasses (Elymus spp.). During epidemic outbreaks, it will also feed on herbaceous vegetation. This species has a very long flight period, extending from late April to November. Specimens have been collected with nearly constant frequency from May until the end of September. It is nocturnal and comes to lights. This species is a major agricultural pest species in grass seed fields of western Oregon, particularly in rye grass fields. During epidemic outbreaks, it will also feed on various herbaceous crops such as alfalfa and peppermint.